This week we’ve had the politicians talking about General Motors plant closings. Five plants in the U. S and 14,000 jobs are on the line. Canadians are in Detroit THIS WEEK trying to convince GM not to close their plant in Oshawa, Ontario with 2,500 jobs on the line. 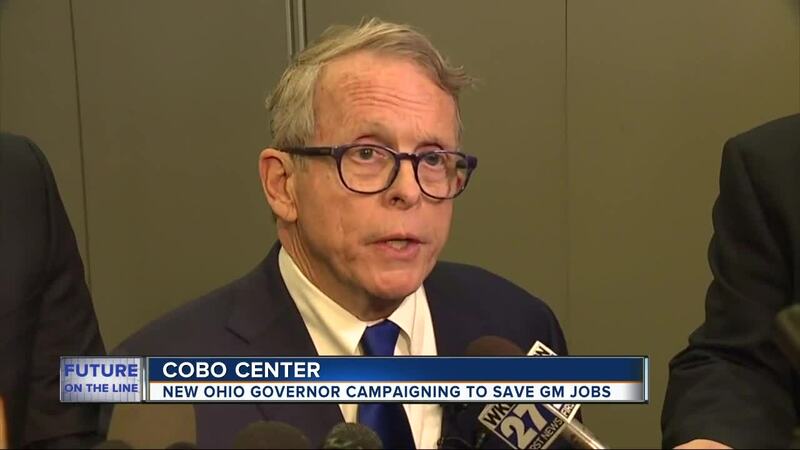 Ohio’s new Governor Mike DeWine is only three days in office and he’s trying to save a GM plant in Lordstown and 1,500 jobs a top priority. He will meet face to face with GM CEO Mary Barra. COBO CENTER (WXYZ) — This week we’ve had the politicians talking about General Motors plant closings. Five plants in the U. S and 14,000 jobs are on the line. Canadians are in Detroit THIS WEEK trying to convince GM not to close their plant in Oshawa, Ontario with 2,500 jobs on the line. Ohio’s new Governor Mike DeWine is only three days in office and he’s trying to save a GM plant in Lordstown and 1,500 jobs a top priority. He will meet face to face with GM CEO Mary Barra. “We want to be a partner. We would like to have a new line put in there by General Motors” said the Governor. Some of the workers from Lordstown are also here with a campaign they are calling Drive it Home. “One thing we do know is companies hate bad publicity,” says Chrystal Carpenter with 23 years in GM Lordstown. GM doesn’t seem to be listening to people fighting for their plants and jobs. “It’s sad,” says Joe Martin also with 23 years in GM Lordstown. The GM Detroit Hamtramck plant is set to close in July with 1,500 jobs on the line. Also included in the group are the Mayor of the Lordstown Village and the CEO of the Youngstown Warren Chamber of Commerce, James Dignan. He says everyone is in this together. “What can we do as a public and private partner,” he says. In addition to meeting with the Ohio Governor, Mary Barra will speak tonight at the Automotive World Congress in the Ren Cen. What will she say anything about the plant closings?